DIY (do it yourself) projects are big right now. We love the idea of taking on home projects yourself to save some money and get the satisfaction of a job well done by hand. 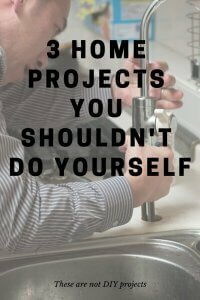 However, while there are many home projects that you can take on yourself, there are some projects that you just shouldn’t attempt. These are projects that require skills that the average homeowner doesn’t have, or have big risks to your property. Here are three projects you should leave to the professionals. Almost anyone can change a light bulb or switch out a light switch cover. However, beyond these basic tasks, it’s a good idea to leave the electrical components in your home alone. This is for a variety of reasons. First, electricity can be dangerous. If you don’t know what you’re doing and you touch or cross wires, you can electrocute yourself, causing serious injury or even death. It’s also possible to do the wiring wrong. It might look fine but actually be a fire hazard just waiting to happen. Plus, electricity is an important part of your life. If you mess up and kill the power in your house, it will be a pain to deal with. Leave it to the professionals who know what they are doing. They won’t hurt themselves, and they will know the proper electrical code and do the job in a safe manner. Again, there are small plumbing tasks that homeowners can take care, such as tightening a leaky faucet. However, most plumbing tasks should be left to the professional plumbers. This is because of the risk of water damage. Your pipes have a lot of water flowing through them, and a broken pipe can cause a huge amount of water damage. We treat water damage in carpets, and a leading cause is broken or leaky pipes. Don’t be the person who thinks they save a little money by replacing a pipe themselves but ends up flooding their home and costing a lot more in damages. DIY carpet cleaning may seem mild compared to electrical and plumbing projects. However, consider this: your carpets are one of the biggest investments in your home. It would cost a lot to replace them if something went wrong. And DIY carpet cleaning methods are likely to go wrong. The first thing that can go wrong is mold and mildew growth. This occurs when the carpets are left wet for too long. If you don’t have a good way to extract water from your carpets during your cleaning, this is a real risk. The next risk is staining your carpets and getting them even dirtier. Homemade carpet cleaning solutions often leave behind a layer of sticky residue. This will attract more dirt and make your carpets worse than before you cleaned them. Carpet cleaning should be left to the carpet cleaning professionals in order to keep your carpets clean and healthy. By all means, take on DIY projects around your house. Just be careful that you don’t take on projects with a big risk of damage or injury. It’s just not worth the small amount of money that you would save when you consider how much it would cost to repair the damage if something goes wrong.